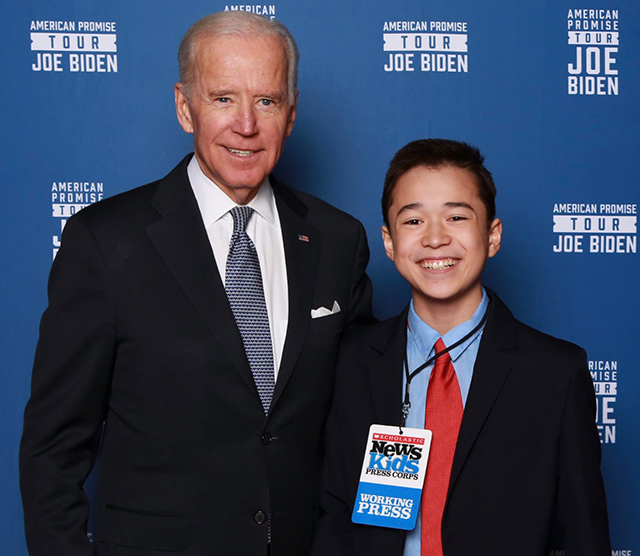 Biden Brings Hope to Tour | Kid Reporters' Notebook | Scholastic Inc.
On December 4, former Vice President Joe Biden spoke at the Wilbur Theatre in Boston, Massachusetts. Biden has recently been touring the country to promote his new book, Promise Me, Dad: A Year of Hope, Hardship, and Purpose (Flatiron Books, November 2017). In 2015, Biden’s elder son, Beau, died of cancer at the age of 46. Biden was then serving as Vice President of the United States. In 2016, after Beau’s death, then-President Barack Obama announced a national "Moonshot" initiative to help eliminate cancer. He named Biden to lead the $1 billion initiative. “Finding a cure for cancer has become a passion in my life,” Biden said during his visit to Boston. Biden also addressed such issues as President Donald Trump’s plan to build a wall on the southern border of the United States to keep out illegal immigrants. “It’s crazy” Biden said of the wall. “The people who come [to live in the U.S.] are filled with intensity, optimism, and courage.” The former vice president pointed out that Beau was treated by a Chinese-American physician. During his book tour, Biden has also focused on ways to help the struggling middle class. He cited the loss of jobs and hope plaguing many communities. While acknowledging that there are many challenges, Biden said that he still believes in a brighter future. “We are the only country in the world—because of our make-up—where everything is possible,” he said.